Air Navigation Pro Android 2.2 Updates and Features! Aviators who fly with their Android mobile devices are sure to enjoy this Air Navigation Pro update at the start of the year. With our never-ending quest to provide better service with each update, we have improved user experience to match some features that can be found in the iOS version. 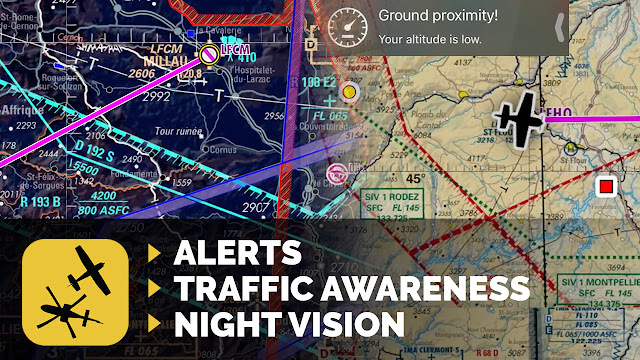 The 3 main features such as Traffic Awareness, Situational Alerts, and Night Vision are some of the most well-loved functions in the app that pilots have come to appreciate in and out of the cockpit. These enhanced functions even help pilots who do solo flights Anyone who has flown with a support pilot, who watches for traffic and enhances your understanding of Air Traffic Control instructions, knows the feeling of relaxation that occurs when sharing the work load. With all of its advancements, Air Navigation Pro has become this helpful trusted co-pilot in the cockpit while also being the friend that practically does the flight planning for you. Air Navigation Pro iOS and Android improve your situational awareness by displaying the traffic around you. With your network connection activated, enable the traffic awareness feature and broadcast your position via the Air Navigation Pro traffic server. This feature displays traffic information on your moving map, and alerts you if a risk of collision is detected. To enable this feature go to Maps > Maps Options > Traffic Awareness > and enable the "Show Traffic On Map" button. Various icons representing aircraft nearby will appear on your moving map with distinct alerts whose appearance is a quick indication on the proximity or range. White indicates the safe distance zone, Yellow for the warning zone, and Red when a risk of collision is detected. Flying in formation or coordinating a rendezvous with a friend? Simply tap on an aircraft to tag it as favorite. The color will automatically change to yellow. In addition tapping on a flight icon will display additional information such as the aircraft call sign, speed, vertical speed and altitude. Traffic awareness enhances safety while flying, while also offering the benefit of being a member of Air Navigation Pro pilot's network. Pilots can use the app to broadcast their location via the Air Navigation Pro traffic server while simultaneously viewing fellow pilots in the same area. Once again, not only being a practical feature but a fun one that allows us aviators to experience the fun with our flying friends. Situational Alerts are invaluable for pilots in the critical phases of flight, (take off, approach, and landing). It alleviates pilot workload and mental strain incurred while searching for the necessary information in the busiest flight times. Alerts allow us to focus on flying the plane, while pilot assistant notifies you when necessary. Air Navigation Pro has personalized this feature to your preference, allowing you to receive either ground proximity or airspace alerts. What’s more is that the Cruising Altitude alert can be sent to prompt you when you reach your target altitude (no more blowing through an altitude and receiving an embarrassing call from ATC reminding you of the altimeter setting). 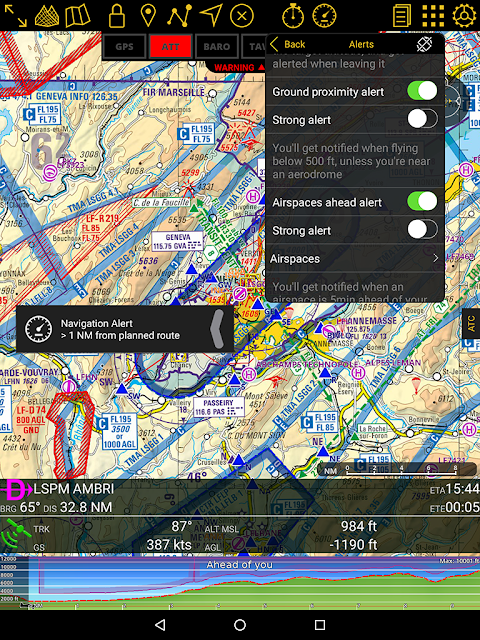 To enable Situational Alerts: tap on Flight > Flight Parameters > Alert, to display the alert menu on your app. The cruise altitude alert notifies you when the target altitude is reached. Enable this feature and select your target altitude in feet to receive an alert when the target altitude is reached or abandoned. Ground Proximity Alert notifies you when the flying altitude decreases to below 500 feet. A smart move, as to not distract us pilots in the final landing phase since this alert will automatically disable near airports. Airspace Ahead Alert will notify you when an airspace is 5 minutes ahead of your current course and you can customize the class of airspace you wish to receive alerts for. This is for both assisting pilots in locating airports and to avoid airspace we’re not cleared into. Night Mode has been invaluable for all my late evening flights. It takes 30 minutes for the rods of the eyes to adjust in the low light setting. Thanks to the advancements of Air Navigation Pro, we no longer have to worry about ruining our vision and being blind while waiting for our eyes to adjust back from a too bright tablet back light. 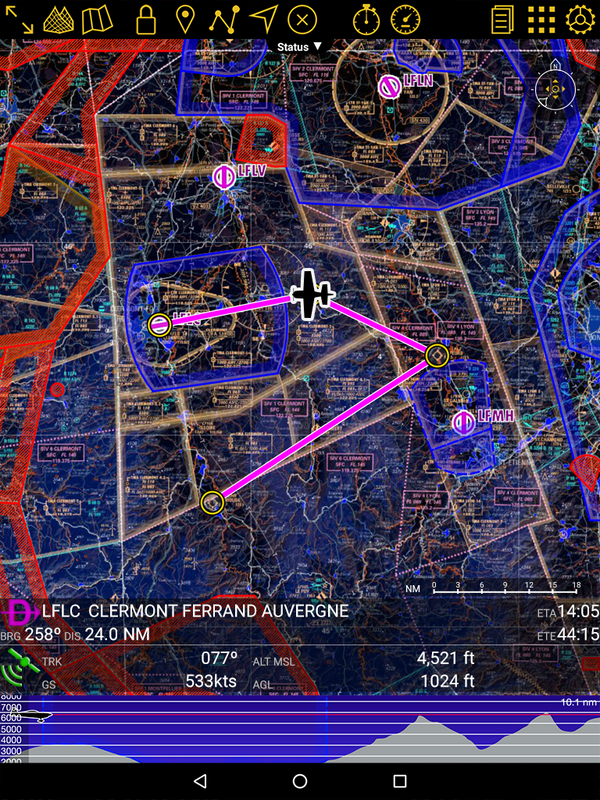 Air Navigation Pro iOS and Android now allows you to switch to a night vision theme for the entire app. Set up night mode from Map Option Settings by tapping on Night Mode at the top which toggles the switch on. Routes and airspaces remain red, while purple and blue highlight colors, as well as important text so essential information is easily visible. The night vision feature is great for use in low light condition or, if you’re like me who prefers the black back display in day time too. 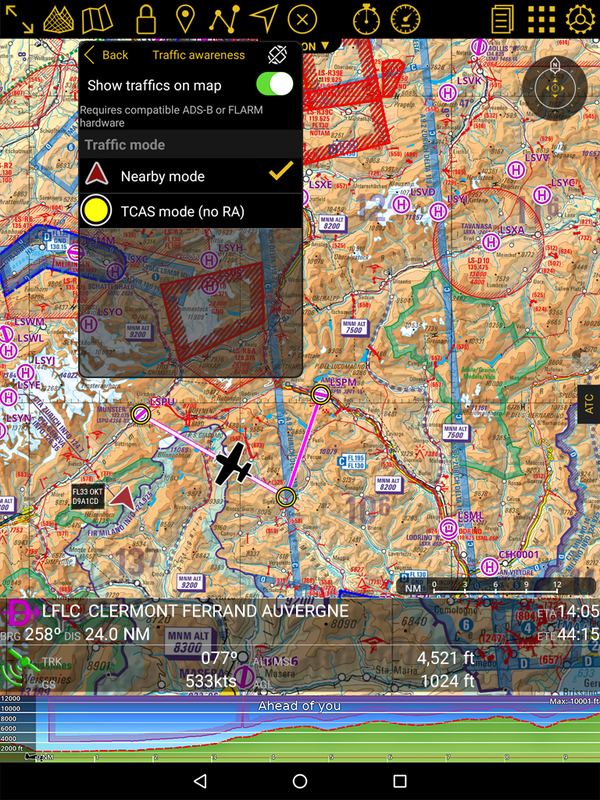 The night vision also converts the colors for approach charts and documents to create a whole new experience with Air Navigation Pro new theme. One final bonus feature now available on Android is the Streets and Places search. This is clearly valuable for anyone flying visually to locate their destination or trying to over fly Mom's house to wave or stop by for a story. Easily access the Open Street Map. Streets and Places search database via a yearly subscription and while you’re there, check out Air Navigation Pro subscription options on services.xample.ch. Both iPad and Android users can appreciate the team at Air Navigation Pro who keep the Android version and iOS versions updated with the best and latest options for pilots. It’s so good, you’d think you were flying with a full crew of supportive flight assistants and co-pilots. What is your favorite Android 2.2 feature? Let us know in the comments below!